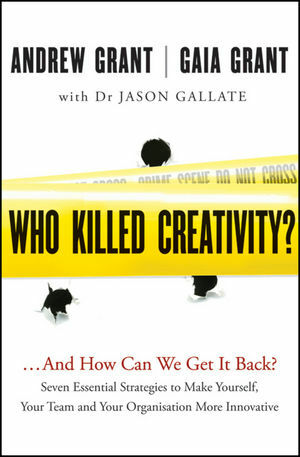 Who Killed Creativity? : ...And How Do We Get It Back? Your help is needed to crack an unsolved crime: creative thinking is critical for future fulfillment and survival, and yet it is now declining at an alarming rate. In this original mystery-style approach, you will have the opportunity to match your knowledge against that of the latest brain researchers, psychologists, and sociologists as you are taken on a humorous and often startling journey to discover why creativity is dying an untimely death. The '7 Rescue Strategies' then provide proven innovation solutions, from personal issues through to organizational imperatives. Authors Andrew and Gaia Grant have travelled the world for more than 25 years working with more than 20,000 international keynote and workshop participants in more than 30 countries at all levels. With a fascinating forensic approach, revealing carefully researched facts and anecdotal insights, this is a compelling modern tale. And there is a final twist that will leave you wondering.... Can we really live happily ever after? ANDREW GRANT and GAIA GRANT are the executive directors of international consultancy Tirian, and have travelled the world for over 25 years to explore creative thinking for positive change. The book includes insights from DR JASON GALLATE, an award-winning neuroscientist and specialist psychologist.